Apple cinnamon raisin oatmeal cookies are a relatively easy to prepare vegan treat that can be made in 30-45 minutes (preparation and baking times combined). Leftovers can be stored in a covered container in the refrigerator for a week (if they last that long). 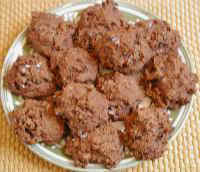 Place the spelt, or whole wheat flour, and the ground rolled oats (oatmeal), or quick oats in a bowl and mix together. (The rolled oats can be ground in a blender on high speed. Be sure that the container is dry before grinding.) Add the cinnamon and mix. Add 1 cup of the raisins and mix well to ensure that the raisins are separated and each one is coated with the flour mixture. Wash the apples and cut into quarter sections. Remove and discard the cores. Place apple sections in the blender container. Add the remaining 1/2 cup of raisins and blend at high speed until all the raisins are thoroughly ground and blended with the apples. Add the pureed apples and raisins to the flour mixture and mix thoroughly with a stiff spatula or spoon. If the cookie dough is too stiff, you may add another pureed apple or a little apple juice. A thinner dough will make a flatter cookie. 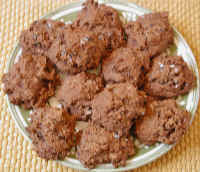 A stiff dough will make irregular thick cookies like the ones shown in the photo. On a non-stick or lightly oiled baking sheet or pan (instead of using oil, the baking sheet or pan may be coated with a thin layer of quick oats to keep the cookies from sticking), place the cookie dough in twelve equal sized "mounds." Place the baking sheet or pan in the preheated oven and bake at 350 degrees F. for 20 to 25 minutes. Various ovens bake differently, so we suggest that you begin checking the cookies after 15 and 20 minutes of baking. When the apple cinnamon raisin oatmeal cookies are baked, remove from the oven, and cool.